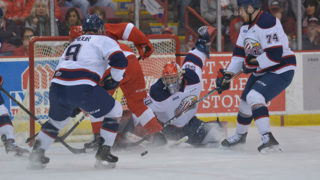 For the eighth time in nine tries, the Soo Greyhounds would pick up a win on opposition territory. 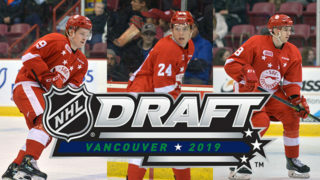 Their specialty teams, led by BOBBY MACINTYRE, highlighted the first period of play as the Hounds scored two powerplay and one shorthanded goal. On their first man advantage of the game, MACINTYRE moved the puck from the right wing wall to the point and CONNOR TIMMINS high blast went overtop Liam Herbst for the 1-0 Greyhounds lead. 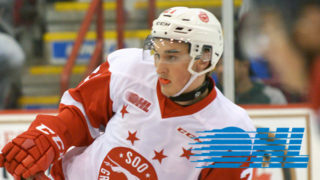 Timmins, who entered the afternoon as the Hounds 3rd leading scorer, it was his 2nd goal of the year. 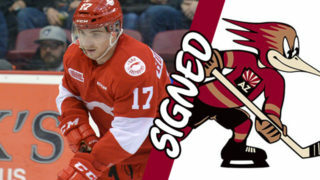 Albert Michnac pulled the Storm even just past the midway point of the first period stickhandling to the middle of the Hounds zone and following up on his initial shot, to beat Matthew Villalta. Five minutes later the Hounds would strike while shorthanded. The duo of BORIS KATCHOUK and MACINTYRE sped up ice as part of a 2-on-1. As they got deep in the zone KATCHOUK attempted to move the puck over to MACINTYRE but the puck hit a Storm and came right back to him. Boris’ quick release would beat a committed Herbst to help regain the Hounds lead, now 2-1. That was the second shorthanded goal in as many games for KATCHOUK. Then with under two minutes to go in the period, another powerplay goal, would extend the Hounds lead. MORGAN FROST moved the puck down to ZACH SENYSHYN who was parked at the right post of the Storm goal. A feed across in front would hit BOBBY MACINTYRE who fired home his 7th goal of the year and a 3-1 Hounds lead after the first period. 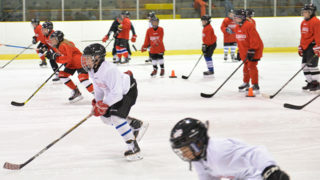 A constant parade to the box would overshadow a scoreless second period. 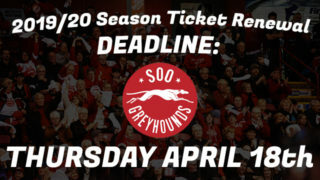 Guelph was assessed four straight penalties in the opening five minutes resulting in an extended 5-on-3 for the Greyhounds while late in the period, it would be three straight minors against the Hounds. And while neither side would capitalize in the middle frame MATTHEW VILLALTA would be called upon for his biggest saves to that point of the night. With 8:42 remaining in the second, the rookie netminder got a piece of a Noah Carroll shot and then dropped and caught up to the trickling puck to keep it out of the Hounds goal. He faced eight shots in the period. Guelph would carry over 1:28 of the man advantage into the third period. While shorthanded and just seventeen seconds into the period, BOBBY MACINTYRE would record his 2nd goal and 4th point of the afternoon skating in alone from neutral ice and shooting low on Liam Herbst. The Storm would fire seventeen shots on goal, including a goal by Cedric Ralph in the third, to outshoot the Hounds 33-32 overall. MATTHEW VILLALTA continued to play strong, while TIM GETTINGER sealed an empty net in the 5-2 win for the Hounds. To view the online boxscore CLICK HERE. After returning home for a few days the Hounds will head back out onto the road for a quick two game roadtrip. They’ll be in action next on Friday, November 4th in their latest meeting with the Sarnia Sting. Game time at the Progressive Auto Sales Arena is 7:05 p.m. Fans can tune into all the action on Rock 101 (101.3 FM) starting with the pre-game show at 6:35 p.m., or watch on ShawTV (Cable Channel 10) starting at 7:00 p.m.